Vampires. Can you really re-create them, mold them differently? Is it possible to present the blood drinkers in a fresh, yet believable style? I wasn’t sure before reading this anthology, but Evil Jester has done it. The anthology opens with an intro by the great grand-nephew of Bram Stoker, Dacre Stoker, who takes us on a journey of his research into his ancestor’s life and most famous work. “The Contest of Inescapable Misdirection” by Linda Addison is a unique piece of game instructions in poetic form. It reads like a stylized “Choose Your Own Adventure” book. Only here you have to choose whether you begin the game fully alive… or not. Either way, the rules of the dead are not set in your favor. As an MMA fan, I enjoyed “The Things that Live in Cages” by Jonathan Maberry. The story sympathetically dealt with an athlete, a master of his art, past his prime but unwilling to give up the lure of the cage. Descriptions were tightly written, the martial arts styles and combos well researched. Most impressive were the characterization of vamp involved and the method of blood sharing; it was a refreshing take on what can at times be stale tropes of the genre. Horror and erotica blend so well together that there can be a fine line between the two. Joe McKinney’s gut twisting “She Grew a Pair” was horrotica done radiantly well. He captured the emotions and reasoning that many women in abusive relationships use in these situations. In what world does a woman fear the wrath of her husband over an infuriated vampire? The actions of the husband were so vivid and so cruel that I cringed for the female lead. Horrifying for reasons beyond the undead. Add in the multiple tragedies of “Bonesong” by Rain Graves. This was an eloquent story with a fresh point of view character and an inventive way of the villain gaining immortality. Visceral, heartbreaking action that doesn’t stop hacking at you until the very end. Evil Jester has managed to find authors that are keeping the vampire mystique new, interesting, and scary. 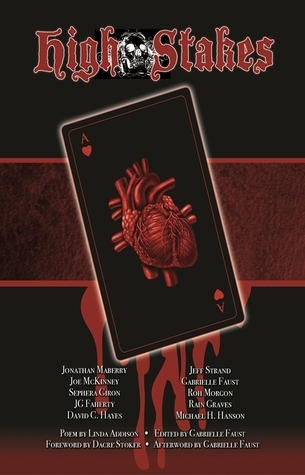 High Stakes has stories that will satisfy the most bloodthirsty fan of the evil tortured nosferatu.